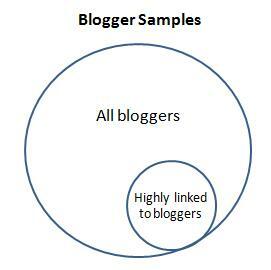 A brief search of the Internet unveils the obvious: bloggers are not all alike. 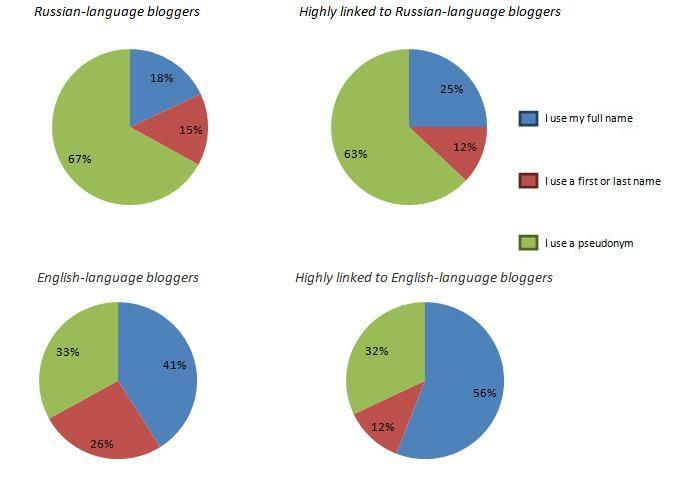 Rarely does the average Internet user get a chance to dig deeper into how and why bloggers’ habits and attitudes vary, much less across linguistic divides like Russian and English. That is precisely what we did. Our surveys of Russian-language bloggers and their English-language counterparts present an opportunity to compare what topics these bloggers write about, which institutions inspire their confidence, and whether they prefer to blog anonymously or not. The survey results offer a glimpse into these two diverse blogging cultures: Russian-language bloggers are more likely to blog about politics, remain anonymous online and exhibit low levels of confidence in many civil institutions. Their English-language counterparts prefer to blog about more lifestyle topics, use both pseudonyms and full names, and display higher levels of confidence in certain institutions. The full survey results are available here. When we asked Russian bloggers to list the topics they had blogged about in the past month, one subject quickly emerged as the frontrunner: politics. 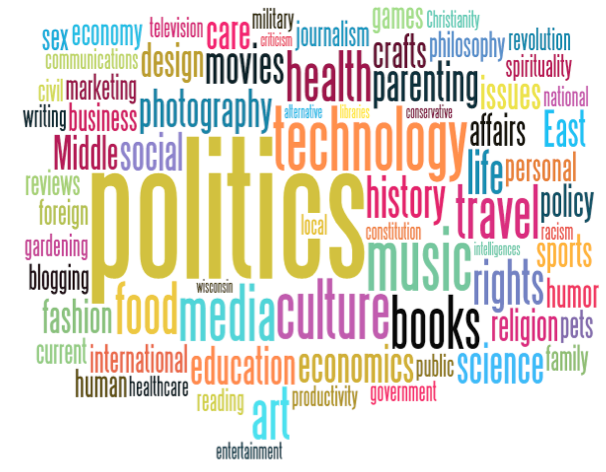 The word clouds below show that politics is one of the most popular topics in both groups of bloggers we surveyed. We tallied up the actual responses, too, which shows that about 20 percent of Russian-language bloggers and nearly 40 percent of highly linked to Russian-language bloggers have blogged about politics in the past month. 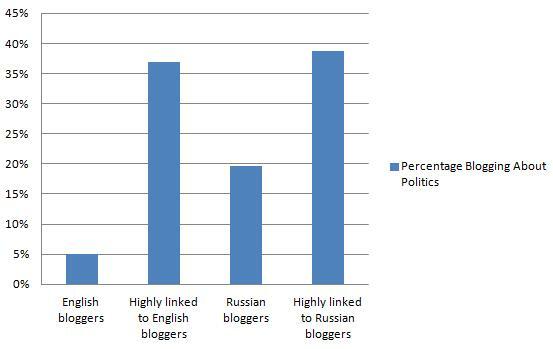 Highly linked to English-language blogs are on par with their Russian counterparts in blogging about politics. 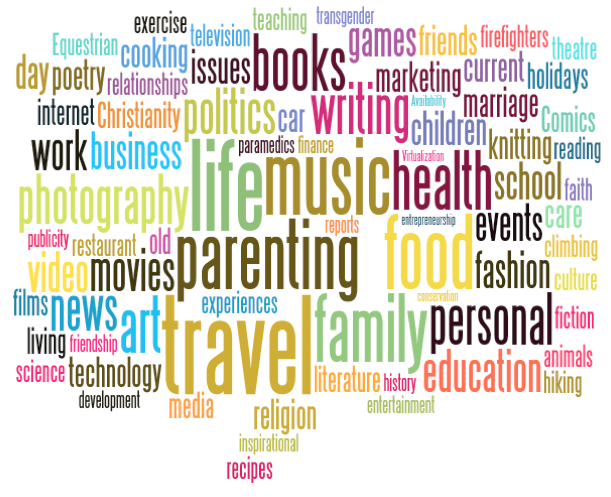 However, politics is a less popular topic among English-language bloggers, who tend to write more about hobbies, family issues and professional interests. When we tallied up their responses, only about 5 percent of English-language bloggers said they had blogged about politics in the last month. The finding that Russian-language bloggers frequently discuss politics supports results from the qualitative coding of more than 1,000 Russian blogs the Berkman Center completed as part of its earlier study of the Russian blogosphere, which was based on linked-based social network analysis. It also counters many of the assumptions made in the academic and popular press of an unengaged or apathetic civil society in Russia, both online and offline. We surveyed bloggers between November 2011 and January 2012, around the December 2011 Duma (Parliamentary) election, an event that mobilized many Russians to participate in large-scale protests not seen since the fall of the Soviet Union. Protests in Russia continued through the March 2012 presidential election that put Vladimir Putin back into power for a third term. Given the notable role attributed to social media and blogs in organizing protests and spurring election-related conversations offline and online, politics undoubtedly continued to dominate the blogosphere after we completed our survey. However, our survey suggests that Russian-language bloggers were engaged in political conversations even before protests mobilized many Russians into action on the streets, suggesting that they are far from being disengaged even when politics is not the topic du jour. When they do blog about news or politics, both Russian- and English-language bloggers share an affinity for what’s happening in their backyard, preferring to blog about domestic issues over international ones. Both sets of Russian-language bloggers in our survey prefer to blog under a pen name, especially when compared to their English-language counterparts. However, among those that write pseudonymously, anonymity is far more important to English-language bloggers than Russian-language bloggers. Fifteen percent of Russian-language bloggers use only their first or last names, 18 percent use their full names and 67 percent opt for pseudonyms. Highly linked to bloggers are not more likely to use their full names, either, with only a quarter of them reporting that they blog with their full name. Among Russian-language bloggers using pseudonyms, though, only 34 percent said it was very or somewhat important to maintain anonymity on their blogs. Comparatively, almost three-fourths of English-language bloggers using pseudonyms think it is important to preserve anonymity. Why are pseudonyms, then, so popular among Russian-language bloggers when the anonymity presented by pseudonyms seems less important? Unfortunately, our survey does not ask bloggers to identify factors that led them to choose pseudonyms over full names. However, use of pseudonyms may simply be a reflection of the convention among Russian-language bloggers to use a pseudonym, even though readers often know their real names. It may also be affected by technology, as LiveJournal, the most popular blogging platform for Russian-language bloggers, may encourage pseudonyms by asking users to create unique usernames for their accounts when they start their blogs. Our survey asks bloggers about how much confidence they have in various institutions, yielding some fascinating data about the low levels of institutional confidence Russian-language bloggers display across the board. While the levels of confidence vary institution by institution, no single civil or social institution garners high levels of confidence from a majority of Russian-language bloggers. Russian-language bloggers report the most confidence in charitable and humanitarian organizations (43 percent report absolute or a lot of confidence) and environmental organizations (42 percent). In contrast, they report the least amount of confidence in political parties (93 percent report not very much or no confidence) and television (89 percent have not very much or no confidence). English-language bloggers display a similar lack of confidence in political parties (86 percent report not very much or no confidence) and television (80 percent report not very much or no confidence). Almost three-fourths (71 percent) of English-language bloggers also say they have absolute or a lot of confidence in charitable and humanitarian organizations. Where the two diverge significantly is when they were asked about their level of confidence in the armed forces, police and judicial system. More than half of English-language bloggers report high levels of confidence in the police and armed forces, and 45 percent report absolute or a lot of confidence in the courts. In contrast, Russian-language bloggers show low levels of confidence in all three institutions (26 percent in armed forces, 11 percent in police and 17 percent in the courts). 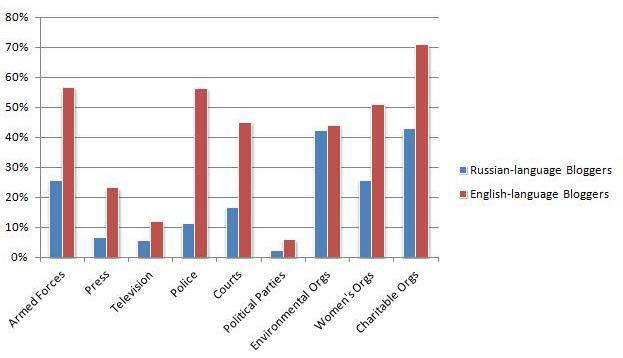 The following graph compares the percentage of Russian-language and English-language bloggers who reported having absolute or a great deal of confidence in various institutions. 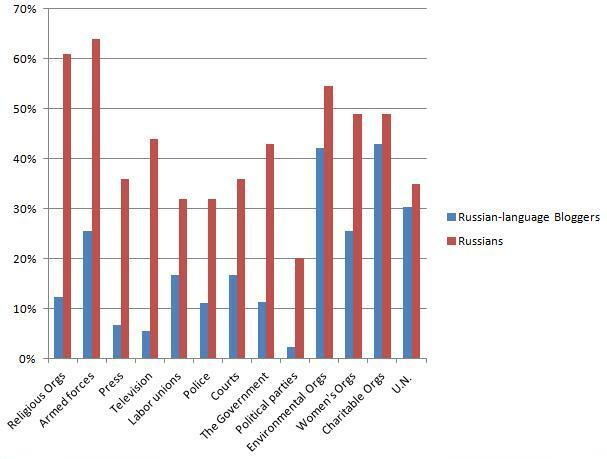 There is some variation in which institutions are favored by highly linked to Russian-language bloggers compared to the random sample of Russian-language bloggers. For example, 17 percent of highly linked to bloggers report absolute or a lot of confidence in the press versus 7 percent of Russian-language bloggers. On the flip side, 8 percent of highly linked to bloggers say they have absolute or a lot of confidence in women’s organizations compared to 19 percent of Russian-language bloggers in our survey. In general, Russian-language bloggers in our survey show lower levels of confidence in their civic institutions, not only compared to their English-language counterparts but also to the general population as well, according to a 2006 World Values Survey that measured institutional confidence among the Russian population with a set of similar questions. Political parties garnered low levels of confidence in comparison to other institutions (only 20 percent of those Russians surveyed said they have absolute/a lot of confidence), but a majority of respondents from the general population reported higher levels of confidence than Russian-language bloggers in the armed forces, environmental organizations and religious organizations. In fact, nearly two-thirds of Russian respondents to the World Values Survey said they have a great deal or quite a lot of confidence in churches and the military. Many of the factors that social scientists suggest influence the low levels of institutional confidence among Russians—perceptions of corruption, historical experience and lack of civic engagement—may similarly apply to the Russian-language blogosphere. However, the overall lower levels of confidence among Russian-language bloggers both when compared to English-language bloggers and the general population offers a glimpse into what Russian-language bloggers think about the offline world. These findings come from a survey of 267 Russian-language bloggers, age 18 or older, carried out between November 2, 2011 and December 12, 2012. The survey was conducted among a sample of 97 Russian-language bloggers, drawn from a list of 50,000 Russian-language blog URLs randomly scraped from the web by Berkman Center researchers, and 170 “highly linked to” bloggers, drawn from a link-based sample generated by Morningside Analytics. In the survey, we addressed respondents’ blogging habits and experience and their motivations for blogging. Findings related to the English-language blogosphere come from a survey of 439 English-language bloggers, age 18 or older, carried out between January 31 and March 24, 2011. The survey was conducted among a sample of 182 English-language bloggers, drawn from a random list of blog URLs generated by Spinn3r, and 285 “highly linked to” bloggers, drawn from a link-based sample generated by Morningside Analytics. Survey questions were identical to those in the Russian-language survey. “Russian-language bloggers” and “English-language bloggers” refer to samples of blogs drawn from two large lists of bloggers, one list consisting of blogs in Russian and one in English. These two sets of blogs are populated by a random sample of blogs based on the URL of each blog so that each blog has an equal probability of being selected. 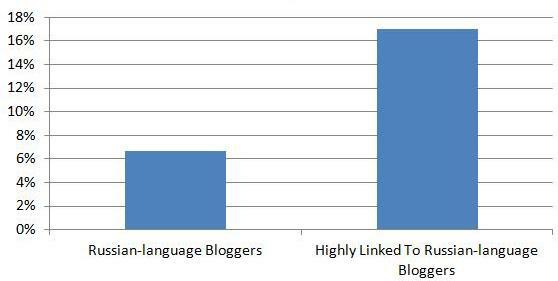 “Highly linked to blogs” represent a second sample of blogs for each language in which blogs are randomly selected by in-links, such that highly linked to bloggers are more likely to be selected in proportion to the number of in-links to a particular blog. Both the URL-based and link-based sets of blogs are drawn from the same two lists of Russian and English blogs. For more, see the ‘About the Survey’ section. Alissa de Carbonnel, “Insight: Social media makes anti-Putin protests ‘snowball,’” Reuters, December 7, 2011, http://www.reuters.com/article/2011/12/07/us-russia-protests-socialmedia-idUSTRE7B60R720111207. The World Values Survey surveyed respondents from Russia, while our survey of Russian-language bloggers includes respondents who do not live in Russia. The World Values Survey asks slightly modified questions compared to our blogger surveys, asking respondents to report their level of confidence in churches and environmental protection movements.